At 6'4" and 200 pounds, Tom was the prototype of the All-American boy. Not only was he good looking, he possessed great athletic ability. At first he excelled in the sport of basketball. Then in the late 1960's his friend, noted baseball star, Randy Niles, taught Chamales the fundamentals of volleyball. Chamales became steadily more proficient in volleyball. He earned a "AAA" beach rating at San Diego�s Mission Beach in 1970. Later, Chamales was lured, by a nice pay check, into the International Volleyball Association. Chamales had an abundance of natural ability when he began his career on the beach. His agility, jump, arm-swing and quickness all contributed to his success on the sand. 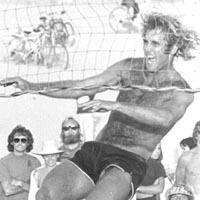 While playing at Sorrento Beach, on an average day, featured very tough games and Chamales was able to hold his own against this competition and went on to win many tournaments, most notably at Hermosa Beach in 1973, then in 1974 at Santa Barbara�s East Beach and then at the Manhattan Beach Open. He was the consensus player of the year in 1974. Chamales won his first "Open" tournament with Greg Lee at the 1972 Santa Barbara Open. He enjoyed most of his success with Ron Von Hagen winning two out of four events in 1973, four out of four events in 1974, and two out of four events in 1975. The 8 tournament victories with Von Hagen were supplemented with seven second place finishes. During his career, Chamales won 12 times out of the 21 times that he entered the finals of a tournament.